Where with mapping we mean free placement of items on an infinite canvas to create structured visualizations representing personal views on "Materials" and "Activities" of many "Courses". The DeepaMehta user interface facilitates research activities such as active reading as well as communication and collaboration with fellow learners. Additionally this plugin allows users to express new relations between moodle items and thus the creation of visible and navigatable paths for others. Furthermore it allows users to read materials (such as PDFs) on demand at the right side of the screen while maintaining a visual working context on the left side of the screen. A personal view on beginner materials of the course "Math 1 for Chemists"
The "External Service"-Configuration needs to allow requests to the following 3 functions: 'core_enrol_get_users_courses', 'core_course_get_contents' and 'core_webservice_get_site_info'. The "External service" must also have the option "Can download files" checked, the option "Required capability" set to "No required capability". The data-interchange format must be set to "JSON". Additonally users must have the capability to "Use REST protocol" and "Create a web service token" to access their "Security Key" under "My profile settings" -> "Security Keys" and pass this on to their DeepaMehta "User Account". 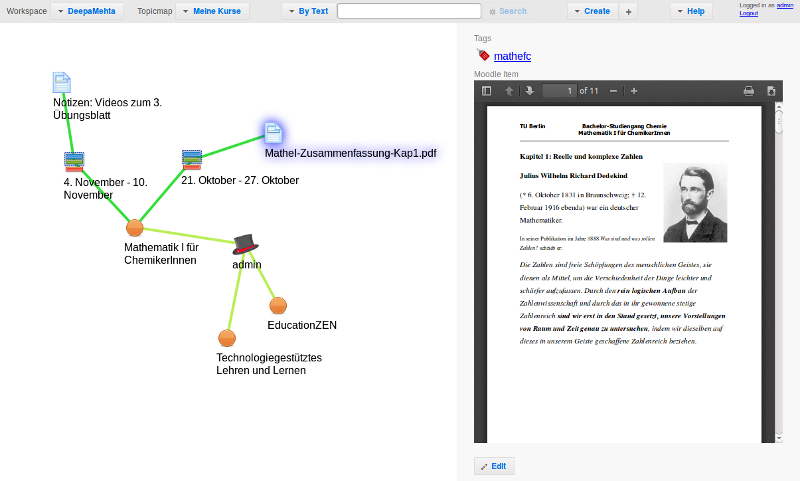 This plugin is a implementation of the ideas presented as a poster at E-Learning Tag 2013, Technical University Berlin. I opened a thread on moodle.org for discussing the potential of developing this idea further.